Smart Protector is an easy to use software, that completely erases history, cookies, temporary files(cache), typed URLs(the drop down address list), AutoComplete, recent document list, recycle bin and more. It allows you to choose which of these items to clear and which to keep. Other features: Cookie Manager; Save/Restore State; Scheduling; Stealth mode; Emergency Key; Deleting of custom files and folders; Recent Program Files. 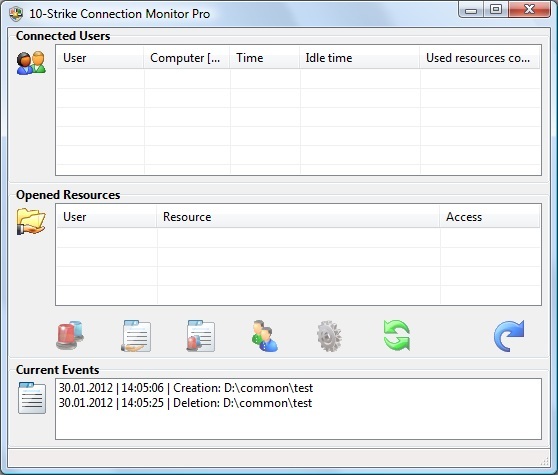 Monitor network connections to your shared resources, find out who opens your files over local network. Protect your servers, be notified when an intruder opens secure or private folders and files. The program writes a log file with information on remote user name, files and folders accessed, date and type of access. It also generates screen, sound, and e-mail notifications, runs external applications on connections to your shares. A.L.A.R.M. silently sits in your system tray until you lock your workstation. If now somebody removes the A/C power connection to steal your laptop, A.L.A.R.M. will play a loud alert from your Laptop speakers until power is back again or you have unlocked your workstation. Basic theft protection if you need to leave your laptop unattended for a short period of time. Any media files can be played, a brilliant alarm siren is included. Free! abylon LOGON protects your computer against illegal access in a comfortable kind. You need only to train a smart card, a USB stick or a CD with your login data. In future you need only this physical key for the login authentication. If you leave the computer you need only to pull the smart card or the USB stick and your computer automatically lock or logoff. Thus protect your computer against snoopier views and data theft without large training. Can't you remember all your passwords and write them on slips of paper? The alternative solution is the software abylon LOGON SSO Home. During the Windows login you must insert only a smart card, a CD or a USB flash drive and an optional password. The windows login and all further password and user-name inputs will be done automatically by the software. And when you remove your key, the computer will be logoff or shutdown immediately. Today in the engineered world many users have major problems with the multitude of passwords. With the software abylon LOGON SSO Pro, the user only authenticate once at the windows logon and have additionally an automatic access to password protected applications. The program boasts with high flexibility, centralized administration and enhanced protection against keyloggers and phishing attacks. Security program requests username and password or simple password upon boot-up and locks desktop by one mouse click. It can't be bypassed on Windows 95/98/ME. All unwanted people are kept out to your PC. Very flexible use: multi-user support(up to 450 users), password encryption, integration with your favorite screensaver and other pleasant additions including hidden measures that can stop hackers/crackers. Security program that request username and password on Windows load-up and fast lock your desktop by one mouse click . All unwanted people are getting away from your computer. It is stronger what Windows XP security. You can see and manage easily user privileges within colored list of users. Empty password users now can be fast detected too. Color logs allow you to take knowledge about usage of computer, tracking of used programs. System Locker is a handy utility that allows you to protect your personal computer from unauthorized access. You can use System Locker to restrict access to your PC. It is attractive, secure, and very easy to use. It starts automatically with Windows and optionally locks your desktop upon loading. It hides your desktop on system lock and provides an informative message to other users. You can set start/stop times for users to limit their access.